Looking at wide eyed, porcelain skinned Alice Hochfeidt, it is all too easy to mistake her for a very detailed, life-sized doll. 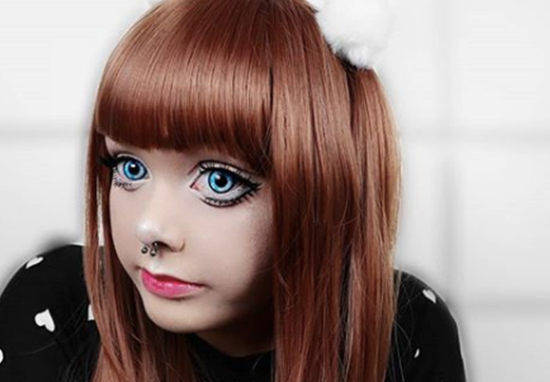 Ever since the age of 13, the British student – who is originally from South London – has sought refuge from her shyness and anxiety by embracing her inner living doll. Her early attempts were by her own admission ‘horrible.’ However, Alice has since painstakingly perfected her mannequin persona; investing in wigs, make-up and cutesy clothing. And with 22,000 Instagram followers, this self-confessed ‘anti-social person’ has built an adoring fanbase who can’t get enough of her toy-like visage. Although she doesn’t venture out in public in her doll get-up, Alice – who now lives in Germany – dolls herself up every other weekend in the privacy of her own home. It is from here she shares her unique look with the world, carefully crafting her appearance during what can be a three-hour-long process. I enjoy slipping into the role of a doll every other weekend. I live alone in a small flat. And don’t really socialise. I like being alone. During the weekend I spend my time turning into a doll taking photos and editing photos. Or relaxing with my boyfriend. I’m just obsessed with trying to achieve the perfect ‘doll’ look. It just makes me really happy and I enjoy working on it. I’m really proud and happy when I create something new. I’ve asked myself many times why I do it. I don’t go out in public in my doll role unless it’s a certain event. Sadly, Alice’s appearance can prove to be a little too out there for many people, and she has been targeted by some closed-minded individuals. I get a lot of hate. So many mean comments. So many people filled with just pure hate or disgust when seeing me. People stay away from me because they dislike my addiction to look like a doll. Also, I get a lot of judgment and people assuming things for example that I’m stupid because I look this way. Despite her doll-like demeanour, Alice wants to be treated with the same respect as any other human being. People need to learn that the amount of beauty is not changed by editing or makeup. It is still the same person and they are still just as beautiful no matter how they wish to present themselves. Just because someone chooses to wear makeup doesn’t mean there less beautiful without it. The amount of beauty does not change. As a shy person myself, I can completely relate to Alice’s desire to find an alternative way to express herself. It takes a truly brave person to wear what makes them happy rather than what is deemed fashionable; particularly when they lack self confidence. Keep doing your thing, Alice, and don’t let the boring bullies bring you down!